Barbells... If you haven't been into a gym (or even if you have) your exposure to them is probably pretty limited. Maybe you've seen videos of bros lifting them above their heads while making guttural noises that sound like they're dying. Or some big dude laying on his back, face bright red, struggling as hard as he can to get that thing up in the air. Nothing looks fun about that. They're loud, and heavy, and there's lots of math involved. PLUS they're not cardio and if your goal is to lose weight, you should be doing cardio, right? (more on that later) As someone who was so intimidated by the idea of CrossFit that it took me a year to come back after I first tried it, I get it. So why do we use barbells in CrossFit? Because building muscle burns calories faster (and for longer) than cardio. You can spend 45 minutes on a treadmill jamming out to your favorite tunes, or you can spend 20 minutes practicing lifts and have a very similar (if not better!) result. Because you aren't good at them right away. Barbell work requires practice and technique. CrossFit works your mind just as much as your body. 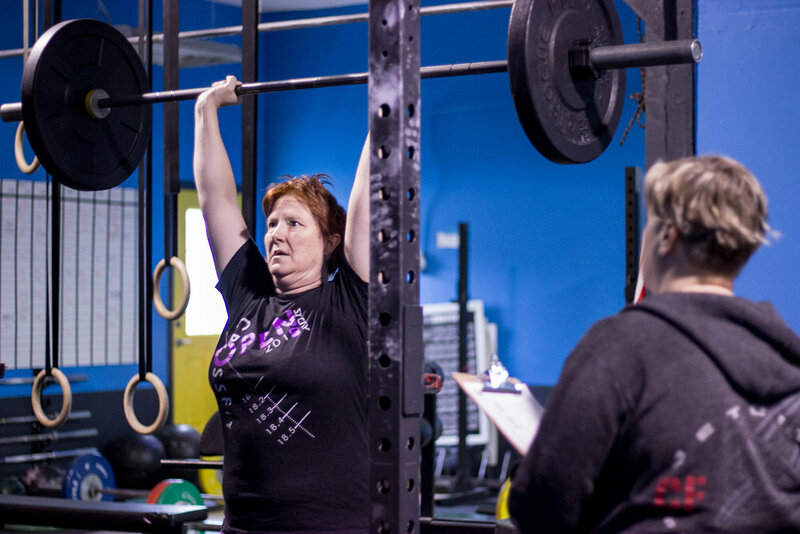 Figuring out the right way to get that bar to your shoulders is one of the best challenges we offer. It's also something you can absolutely learn! Because they use your entire body. Getting a barbell up to your shoulders, even without much weight on it, requires your legs and hips to work together. Give me a short barbell workout over 45 minutes on the treadmill any day (are you sensing how I feel about the treadmill?). Because Functional Fitness! Seriously, strengthening your body won’t just help you at the gym. Lifting a 50lb bag of dog food into your shopping cart!? No problem after a little time spent with a barbell. So why let fear of the unknown stop you? At the end of the day, they're just a piece of equipment - same as a kettlebell, or a jump rope. You don't just walk into a gym knowing how to use a kettlebell, right? Someone needs to show you how best to use it and help you figure out the best weight for you. Could you get hurt using a barbell? Sure, but you can also get hurt walking down stairs. The point of CrossFit is that you have well trained coaches watching out for you and teaching you everything you need to know. Before we let you pick up a barbell, we're going to give you a PVC pipe, and then just a regular ol' pipe, then a barbell that weighs 15 pounds... and so on. You don't just walk into Jet City on day 1, get handed a barbell and thrown into a workout. Safety is the name of the game (and it's one we take very seriously). As a theater person turned fitness nerd, my only exposure to barbells before CrossFit were those terrible videos on YouTube - so I get it. But I can tell you now that they're some of my favorite things to work with in the gym. My best moments have been finally getting the technique on a lift, or hitting a PR (Personal Record) - I usually dance around the gym when that happens. Do you ever dance around the gym in celebration after getting off the treadmill? I'll say it again for those of you in the back of the room: don't let the fear of the unknown stop you. Barbells are just another piece of equipment and it's our job to show you how to use them and make them less scary. CrossFit is infinitely scalable and adaptable - so your aversion to barbells isn't as much of a deal breaker as you might think. Have questions!? Book a No Sweat Intro and let's chat!